Re: Hyenas as pets?!?! Pick included. owned by a Siamese cat, two rats, and a ball python. Woah!!! Is that a Dhole on their list!?!? I would like to help with the conservation of Dholes in the future!!! That's amazing!! Proud owner of a Cat named Oscar, a Kitten named Kleo, a dog named Hershey, and an arctic fox named Kovu. I love dholes, but they're CITES I. I too would love to be able to work with some of the endangered canids. But still, it's nice to know that at least one place out there actually sells them! Some of that websites pictures are stolen. The caracal is a Julies jungle pic, the corsac looks familiar too. Some sure how credable that broker is. They have cheetahs on that list too. Rumor has it they will have hyenas at Lolli's Auction. Ooh... Really? That's exciting. I wish I could go. I'll have to double-check just to make sure I can/can't. I'd love to go to one of these auctions. And hyenas are just an added plus. It's more than rumor, though, isn't it? Consigning animals is a commitment to sell, right? They look cute in the pictures. I don't know if I will go to this one or not. Probably not but I would sure like to see some of the species that will be there...especially the Tayras! I haven't seen the consignment list yet, are they on it? I just know a certain friend said they heard there would be two for sale there, so for me it's rumor. If they are officially on the consignment list then more than rumor but not 100% guarantee just like Mt Hope they can choose to no sale or back out. Consignment deals can usually be terminated at any time. But it's almost a guarantee if they are on the list they they will at least be put up for bidding. They had a mom and baby tamandua on consignment once. I felt the baby was too young to sell unless with mom, they were going up separate. I didn't tell them that because I didn't know them but they changed their mind and they didn't go up for sale. Other times tamanduas have no-saled because people wanted more, even though the bidding went high guess they didn't know their value. Yep, two Hyenas are on the consignment list among some other things. Tayras (which I really want to see), Marmosets, Cavy, Four Eyed opossum, bottle fed Serval and various birds. I didn't know that people could back out of auction sales. I guess the auction people couldn't very well force someone to sell the animal so it makes sense. 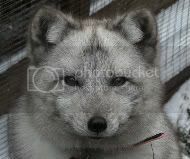 If Arctic foxes get consigned, I may have to end up going just to see some. How close can you get to the animals? I met one woman who went there in years past and made it sound like you could get right next to the cages and pet them and stuff. Lasergrl wrote: Some of that websites pictures are stolen. The caracal is a Julies jungle pic, the corsac looks familiar too. That's because it's one of Valla's baby photos! I am getting so fed up with people using photos of my animals to sell theirs if theirs even exist! I didn't notice that but it was obvious a lot, maybe most of the photos were off the web. I am CONSTANTLY getting e-mails from people saying that people are scamming people with my photos as well as my videos (the videos are mostly my dormice). It just drives me nuts as when I report them very often the site does nothing and then I get more and more mails. I would stop putting up the photos of my guys but I think it would be unfair to the people who enjoy them and I am not going to let the few ruin it for the many. I have cut back on posting photos of Harry and Els as it seems they look so good it was too hard for scammers to resist. On one website they and Mandy's swifts were being sold together by someone in London . Elina, you make one gorgeous vampiress! Ash wrote: Elina, you make one gorgeous vampiress! the_unstable wrote: Agreeing with Ash. Sadly the woman who manipulated the photo died this week , she was only 25 (same age as me).